Namaste! I salute the kindness within you. As all the Nepalis greet us. To me climbing in Asia brings peace. The setting is incredible deep valleys, small villages hanging on the side of the mountain, trails were local people travel daily to work, kids walking to school, expedition team hiking to their base camps, surrounded by majestic snow cap peaks and there is an endless number of peaks. For all levels, from the first timer to the weather Himalayist . I designed expeditions in many region of Nepal, Sikkim and i can offer you my expertise for the peak of your dream, you name it. I suggest if you are approaching an expedition for the first time either Island peak combine with a trek to Everest base camp or Mera peak. 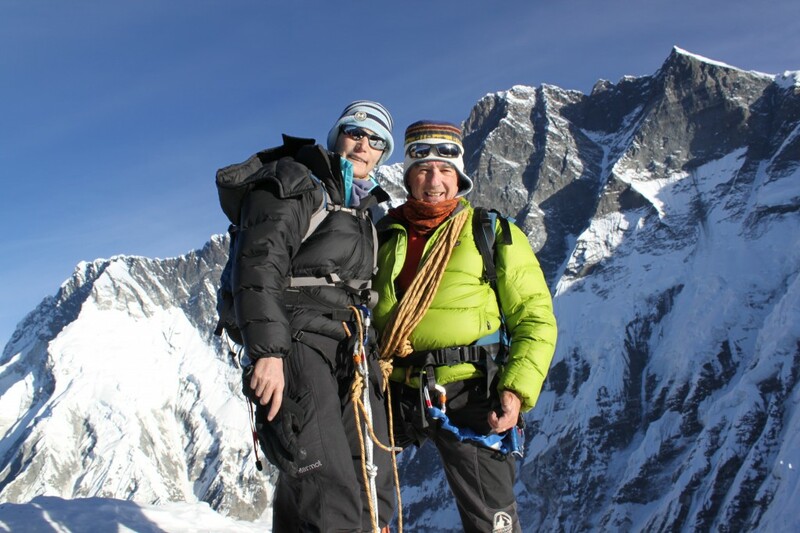 Monica and Jean, summit of Island peak 6,189m/20,305 ft.